Monkey needed a little space for a while, but dinner is dinner. A monkey that escaped from London Zoo yesterday was back in her enclosure after returning overnight. Betty, a ten-year-old squirrel monkey came back after more than 12 hours roaming the treetops in Regent’s Park. 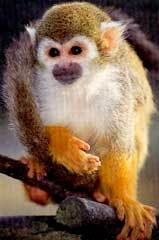 She escaped when staff let an overhanging branch grow over the enclosure she shares with 17 other squirrel monkeys. Her keepers arrived on Thursday morning to find the furry creature gone. Zookeepers monitored her throughout yesterday to ensure she did not come down from the trees. Emma Kenly, a spokesperson for London Zoo said: “Betty remained in trees by the zoo’s perimeter throughout the day, closely monitored by keeping staff and was still in the park when the zoo closed at 5.30pm. She has now been safely reunited with the rest of the group and the exhibit is closed today while tree surgeons are today removing the last overhanging branches in the enclosure to ensure the monkeys cannot go exploring again.